Ms. Celiac Says...: Joan's GF Great Bakes Are GREAT! One of my absolute favorite gluten free foods, are hands down Joan's GF Great Bakes Everything Bagels! When I first started on a gluten free diet, I tried every gluten free bread, bagel, and roll on the market. But nothing tasted anything like the bread I left behind. Everything was so thick and chewy and, honestly, did not taste like it should be edible. Then I found Joan's GF Great Bakes and I was in heaven. They taste like "real" food! I must say that Joan's GF Great Bakes are the only bread, bagels, rolls I eat on a regular basis. Now, everytime I try something new I end up going back to Joan's products. So far, I have tried her Plain and Everything Bagels, Plain English Muffins and Plain Sandwich Rolls and have been blown away by all of them. 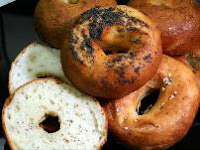 Joan's GF Great Bakes also makes Egg Onion Poppy, Sesame, and Poppy Bagels (available dairy free as well), Chocolate Chip Cookies, Cinnamon Raisin English Muffins, Pumpernickel Raisin Rolls, Onion Sandwich Rolls, NY Style Pizza Crust, and Sicilian Pizza. All of their products have no additives and preservatives and are free of transfats. They are also available at stores throughout NY state, Connecticut, Florida, Maine, Massachusetts, New Hampshire, New Jersey, Ohio, and Pennsylvania.